“Thursday!—” shouted Bowden against the rasp of the engine. Perfectly timed and perfectly witty, this was a really funny book. 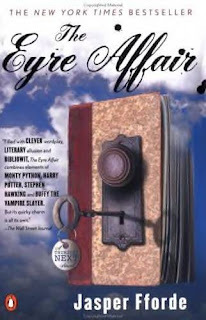 The Eyre Affair is a heady amalgam of comedy and crime, and I guess alternate history, two words together I’d never heard of. Enter the world of Great Britain circa 1985 where time travel is common place, dodo’s are the pet of choice, Richard III is performed nightly with as much excitement as The Rocky Horror Picture Show and people vacation in their favorite novel. But now someone is stealing original manuscripts, kidnapping characters and permanently altering the stories. Hot on the trail of this slippery slope killer, such is a day in the life of Thursday Next, Special Operative in the literary detection division, until her beloved Jane is stolen from the pages of Thornfield Hall. Now she really means business. Think Stephanie Plum with less hair spray and clothes that don’t glow in the dark. Instead of the rat, think dodo bird. Instead of the psycho grandma, insert time traveling father whose face could stop a clock. Landon is no Morelli (not even close), but there is a Vampire Spec Op agent who is dead-pan Ranger with dread locks and the cool shades. Enough comparison though, I liked this book all on its own. In its own way it was original and funny, even bizarre at times. With names like Thursday Next, Captain Braxton Hicks, Jack Schitt, and Filbert Snood how can you go wrong I say. I laughed outloud multiple times. This sounds so fun! I've got to read it! I'm glad you liked it. I agree, it took a long time to build up to the Eyre affair part, but I didn't mind so much because there was so much world to build up in our minds! so far it's a collective 6-thumbs up for The Eyre Affair at 5-Squared. methinks it's gonna be a landslide! I have it on my pile for this coming week! I'm heard just so much about it. I'm a bit afraid it's not my kind of silliness, but I'm eager to just let go and enjoy it all the same! There are 4 more reviews of this here?? I should've dug deeper I guess. I shan't fail again. Really looking forward to book 2. Might even wear a pinky ring and hold it just so while I'm drinking my tea, you know, to increase the atmosphere while reading it. Sorry I can't add apparently. 3 more reviews - Duh. Two thumbs per person. It's that good.